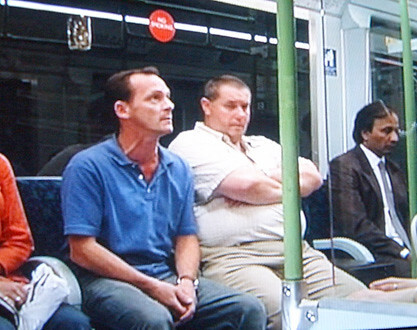 How's your Olympic Tube journey been so far? Yesterday was the first working day of the Olympics and it appears that TfL's "keep away" messages may have had some effect. The London Underground was not as overcrowded and packed as many of us thought it might be. Although people (including myself) were Tweeting that the system was quiet and the "hot spots" weren't hot, TfL's official figures are that Tube journeys were up 4% on Monday 30th July. Not a huge figure! This is a picture I took of Holborn on the Central Line yesterday as I was heading East towards Stratford at about 9.40am. 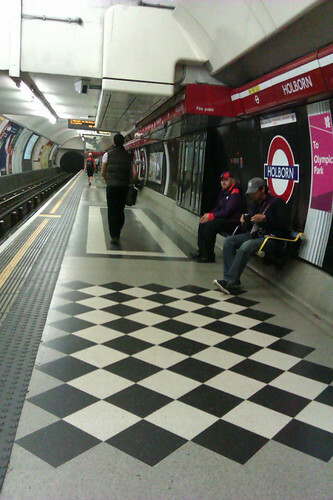 As you can see it's hardly the "exceptionally busy" that TfL were predicting. Although we shouldn't be too complacent or speak too soon as each day will be different. London's transport commissioner, Peter Hendy, said: "Public transport in general, and the Jubilee line in particular, will be exceptionally busy today as spectators make their way to events at key Olympic venues across the capital. "We are very grateful to customers for following our advice to avoid London Bridge station and for major businesses who are enabling their staff to work flexibly during the Games. "Our advice to all users of the transport network continues to be to plan ahead, avoid hotspot areas, and leave plenty of time for your journey." At time of writing the Central Line, one of the main routes into the Olympic Park at Stratford, is suspended from Liverpool Street, due to reports of a fire at Leyton. So if you're making your way to the Games there this morning best use the District or Jubilee Line instead. Meanwhile, Downing Street, Tweeted a blurry picture of David Cameron travelling on the Tube yesterday to watch the Tom Daley & Peter Waterford in the diving finals. 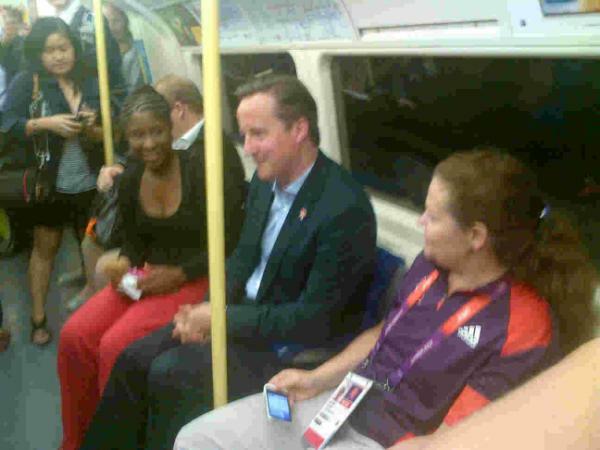 Cameron has been keen to stress how he wanted to use public transport during the Games rather than the special "Games Lanes" branded 'Zil lanes' reserved for VIPs travelling to venues by car. How was your journey into and from work yesterday? Will TfL's 'keep away' Olympics message leave a transport legacy? If you have an Android phone and would like test out a new Tube app, read on. 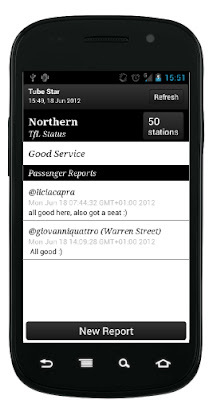 Tube Star was developed by Neal Lathia of Cambridge University's Computer Lab and aims to merge your Tweets with TfL status updates. "You can see the official Transport for London status of each Tube line (and any incidents reported at stations) and hear about fellow passengers' recent experiences." Neal says "Each time you take the Tube, you can post short tweets about what is happening around you: any crowds, delays, disruptions, or even about that lovely person who just gave up their seat for someone in need. Download the app, log into it with your Twitter account and join the Tube Star community today!" I'm going to give it a try as although I follow official Tweets from the each Tube Line I use on a regular basis, they're not always the most up to date. I find that my friends' Tweets or doing searches on Twitter around a particular line or station are often more accurate and they're certainly more entertaining! Neal is interested in feedback on how the app works, and his contact details are on the Tube Star site. 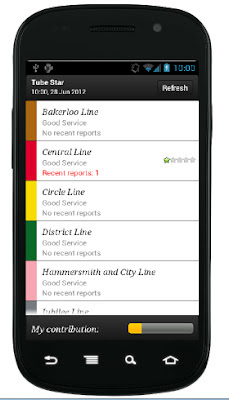 What's the best London Underground iPhone App? For those who love camping or want a Northern Line carriage all to themselves TfF that's Transport for Firebox has arranged for you to take the Tube to your next holiday or weekend break. 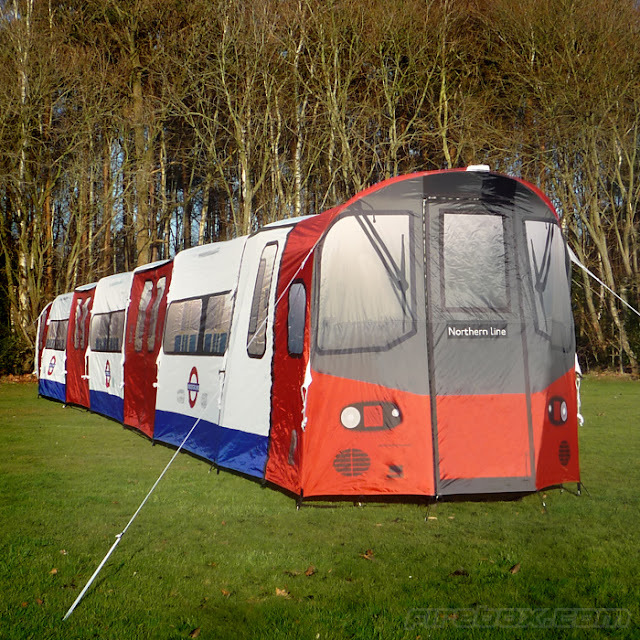 Graeme found this excellent London Underground Tube tent on Firebox, which is topically described "Considering the imminent arrival of armies of hyper-active athletes, and rampaging hordes of tourists for a certain upcoming sporting event, it’s a great time to think about getting out of town." The tent may not be the cheapest of camping options, at almost two grand, but it does sleep 16 people and can hold 72 people standing for parties, so if you all club together becomes more affordable. Firebox have a video on the site on the tent being put together and apparently takes less time than it takes to get to Morden from High Barnet. For the "authentic commuter experience" you can "share your tent with 71 strangers". It's also pointed out that "You can even get in through the drivers door! A rare treat." The Olympic Torch makes it way around London from Saturday 21st July carried by a variety of people and now it appears various modes of transport. I'm keen to see two parts of the Olympic Relay, the one where Billy Mitchell carries the torch through Albert Square on EastEnders and the bit where the torch will be on the front of a London Underground train. The Olympic torch will be attached to a Tube train and travel on an overground section of the system. Tube bosses are keeping the line used a secret as they are worried it will be swarmed by “torch tourists” and cause overcrowding on that line. However, the Jubilee Line has been ruled out even though it is the main route to Games venues. LBC report that the torch will also have a ride on an open top bus driven by transport commissioner Peter Hendy. 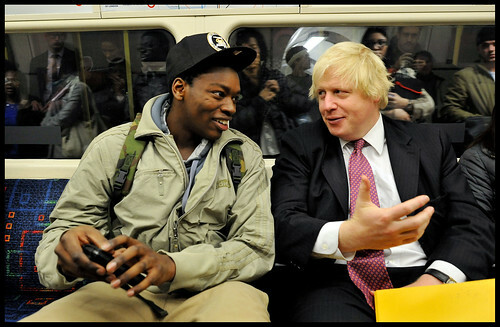 Apparently Boris really wanted to drive the bus, but he doesn't have a bus driving licence. Londonist has full details of where to watch the Torch Relay. If you manage to see the Torch on the Tube, send us a picture. I'll be sticking to watching Billy run through the streets of Walford. A number of publications reported about a leaked document which claims TfL are testing driverless trains on the Jubilee Line in overnight trials. The Evening Standard was one & said "Two Jubilee trains will be converted and run between Stratford and Waterloo stations. Initial testing will take place at night without passengers. If successful, then driverless operation across the entire line, used by 650,000 passengers a day, could begin from 2015." However TfL have denied that tests are taking place. With a slightly confused headline (rain trial???) the BBC spoke to Gareth Powell, London Underground's director of strategy, who said: "Given the technology now available it is very unlikely that London Underground will ever again buy a fleet of trains with conventional drivers' cabs. "Safety will always be our top priority and we have made no secret that from the 2020s new trains could operate on the Tube without the need for traditional drivers." The document was leaked by the RMT whose leader Bob Crow said "This is Boris Johnson's driverless and de-staffed plan for the future of the Tube and it is a lethal combination of cash-led cuts and ignorance that would leave Londoner's riding a daily death trap. The proposals seek to rip up every safety rule in the book - having the trains run by remote control from signal boxes." Unsurprisingly it wasn't long before he threatened strike action "RMT is demanding cast-iron assurances that this whole poisonous cocktail of proposals has been dumped for good and we will have no hesitation in taking the action required to stop this." 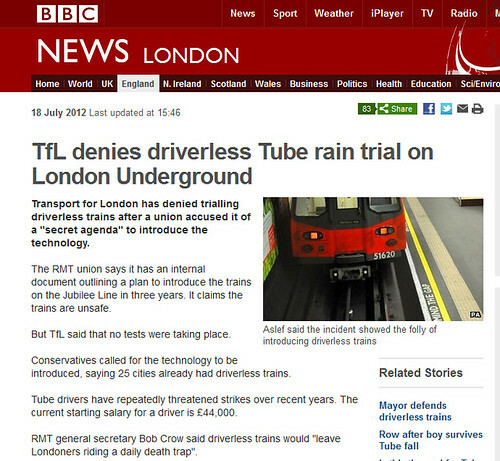 A number of Conservatives have been lobbying for driverless trains for some time and Tory Transport spokesman Richard Tracey called Bob Crow's comments an "alarmist rant", saying: "Driverless trains are a fact in 25 cities around the world and are perfectly safe"
By the way, in case I've misunderstood the BBC's headline and they did mean "rain" - if Tube drivers can do anything to put a halt to the rain I'd welcome these trials. Shaun Buswell has set himself a challenge. 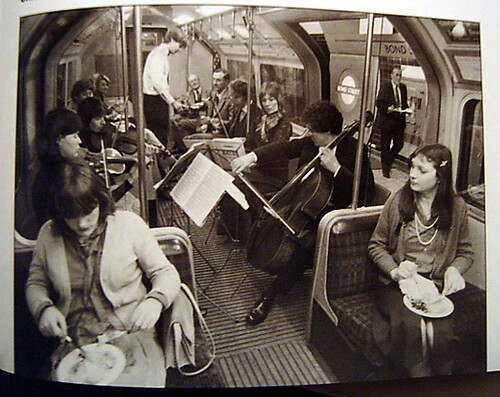 He wants to form an entire orchestra (30-100 people) made up of strangers that he's met for the first time on the London Underground. If this isn't hard enough, the musicians he invites to form the orchestra must be carrying their instrument (or part of it) when he meets them for the first time. So if you're a musican on the Tube and Shaun comes across you he "has" to speak to you. The idea is that the orchestra will then perform at a London venue by 12th December 2012. Shaun must not know the musicians personally nor have met or communicated with them directly in person before (i.e they must be complete strangers to him). I'm not sure where Shaun travels, but since he set the challenge last month he's averaging at 2 musicians a day and it's building up momentum more and more with each passing month. 3) It closed as a theatre for many years, and was also a cinema for a long while. 4) It's 3 times as big as some of the venues I looked at! 5) It's lovely and I really like the people who run it. Very decent folk!" To find out more about Shaun's challenge, you can visit The Underground Challennge or follow him on Twitter @121212challenge or visit his Facebook Page. I wish Shaun the best of luck & I'll be keeping an eye on his Twitter page to see how things develop. The Guardian's Comment is Free asked me to write a piece on the London Olympics & what it meant to me. Anyone who's read my blog for more than five minutes will know that I'm not even slightly sporty and am not remotely looking forward to the Olympics. The best thing that's come out of it in my opinion, is the fact that we've now got WiFi on the London Underground. 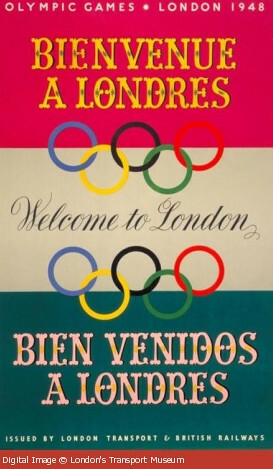 What had fascinated me most about the Olympics is TfL's keeness keep people off the transport system. With the exception of Thames Water (during our recent 'drought'), it's rare that you'll find an organisation spending advertising money to encourage you to use less of a service! You can read my full article on The Guardian's site (thanks to Dave Hill for recommending me for the piece) & there's a lively discussion in the comments about how effective these constant "don't use the service" and "keep away" messages are. My piece was introduced with the following sub heading: "Boris Johnson's voice is being used to keep Londoners off a crowded network. 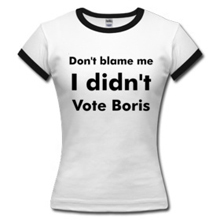 But if it works, perhaps they'll get used to it" By that they didn't mean Boris's voice, but getting used to not using the service. In my opinion having a public address system with Johnson's enthusiastic and excitable tones on permanent loop will do much to keep many Londoners off the Tube. It's probably TfL's secret weapon. Since November 2010 TfL and the Olympic Delivery Committee have been urging us not to use the tube during the Olympics – with the dire prediction that on the busiest days there would be an extra 3m journeys on the transport network, with a 30-minute wait to get on a Tube train. Fast forward two years and the reality of this "don't use our service" policy is in full force. There's a multitude of TfL posters encouraging us to work at home, get on a bike, walk, pole vault, travel on the roofs of cars, do anything but use the public transport system. We're being handed maps at mainline stations with "handy" walking distances to various locations. "Walking is a great way to soak up the Games atmosphere and experience what is happening in and around the city", the map helpfully advises. It might also be a great way to soak up the rain and a lot of sweat. In May 2012 TfL even turned to "gamification" to try to keep us off public transport. They teamed up with a company to produce Re:Route where walkers and cyclists earn points and money off products the more they walked or cycled. Although it appears that even cycling part of your journey might not be an option any more, as bicycles aren't allowed on the London Overground, Southeastern, Southern, Gatwick Connect and Heathrow Express services during the Games period. Also if you cycle in or even stop your bike in the Games Lanes you'll be subject to a £130 fine. Now with just a few weeks until the Olympics start come the transport rehearsals. "Simulated queuing" and other "passenger diversions" took place earlier this week as we were asked to test the transport system. Staff in fluorescent jackets were at major London stations waving passengers, who normally knew where they were going, through one-way systems and weird bottlenecks. This was putting our Olympic queuing skills to the ultimate test. 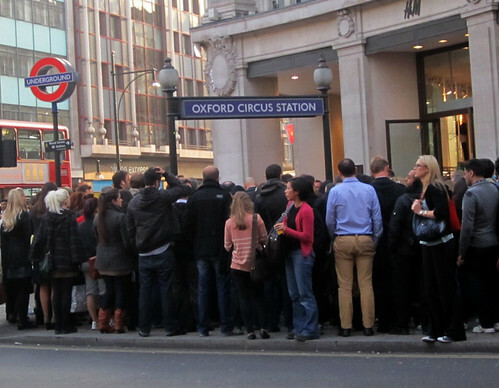 Upbeat internal emails have been sent out by TfL inviting staff to take part in a "tube crush test", just to see how many people can physically be packed into a Central Line train. 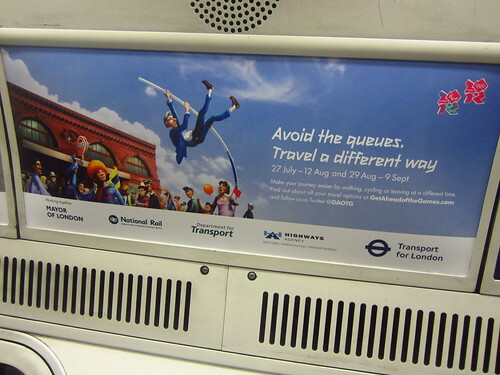 TfL is doing as much as it can to remind us that travelling on public transport during the Olympics is going to be far from pleasant, so why not just avoid it. Will this policy have a longer term legacy on London's transport? Will we discover that we can potentially live without it (& those pesky strike threats)? 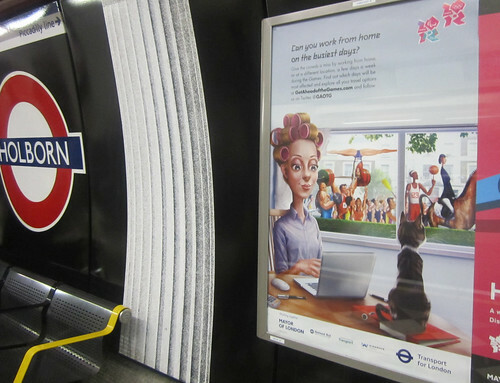 Will teleworking increase, when employers discover that their staff can start work earlier & get a lot more done by working at home in their curlers without being stuck on a Tube? Who knows? 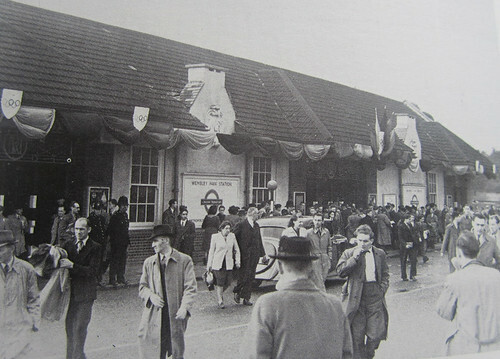 This is what Wembley Park London Underground station looked like in the summer of 1948 when London last hosted the Olympic Games. It's seems to be a picture of calm even though extra services were provided to handle the "crowds"! You can just about see the bunting & a few Olympic rings put up to brighten up the station. I suppose it's no surprise the decor wasn't lavish. The UK was still in the grip of postwar austerity and there were strong arguments against spending funds on the event. Due to the war, the Olympics had already been cancelled twice. 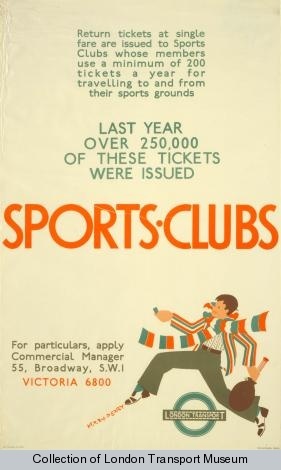 So it was not only a miracle that the Games took place but they were actually very successful and attracted valuable visitors to London. 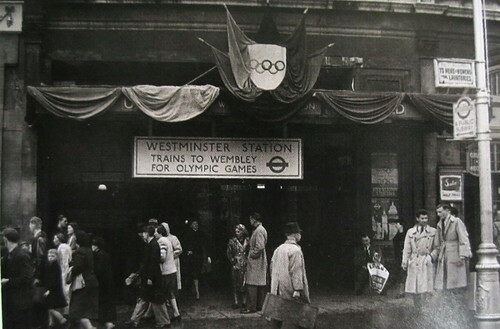 Paul Collins has written an interesting book An Olympic Summer : Transport for London in 1948, based around some fascinating historical photographs. It records the British transport scene during that summer of 1948 when the world travelled to England and the immediate post-war road and rail networks were put to the test. It'll be interesting to see what both Westminster & Wembley Park stations look like in a few weeks time & compare them to our upcoming Olympic Summer. 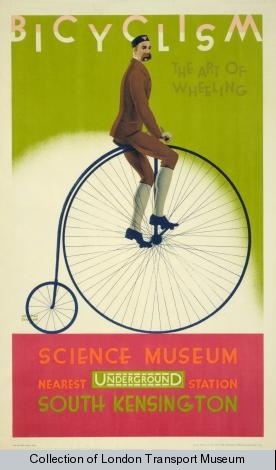 How will historians report on Transport for London in 2012? Bear in mind a lot of the photos we are taking today will be in the history books (or rather e-books) of the future. Tunnelling through London for Crossrail isn't just an major engineering project. While the boring is going on the building of the new railway has uncovered some important and interesting achaelogical remains. Yesterday I was lucky to visit the launch of a one day exhibition Bison to Bedlam of what has been uncovered. The new railway passes through the heart of the West End of London and along the north edge of the Roman and Medieval city. 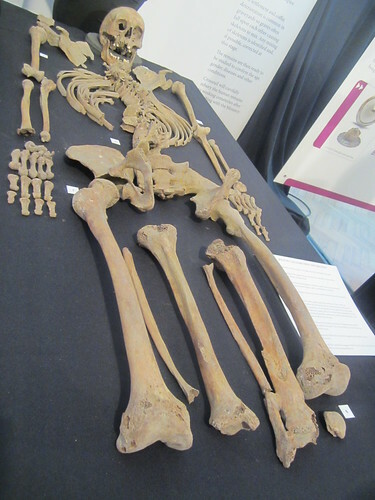 The finds on display include prehistoric animal bones, Roman finds, human remains from the infamous Bedlam psychiatric hospital and remnants of Britain's industrial past. 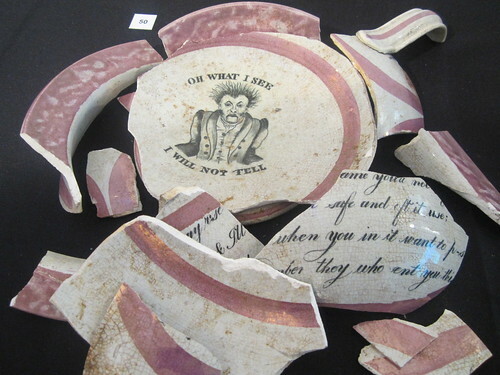 I loved this old chamber pot uncovered at Stepney Green which dates back to the 19th century. The decoration inside the pot has a shocked male face saying "Oh What I see, I will not tell" and on the outside once can make out "when you in it want to p-ss, remember they who gave you this"
Crossrail said "One of the core objectives of the Crossrail archaeology programme is the dissemination of archaeology information to the wider archaeological community, together with a focused education and outreach programme for local communities." 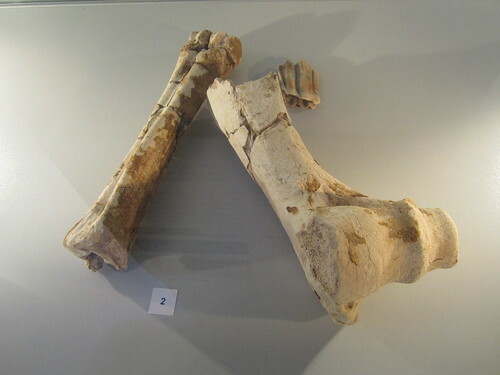 The bison remains pictured above were found at Royal Oak and are around 68,000 years old. I learnt that Royal Oak bison were exceptionally small when compared to other Pleistocene bison. A number of archaeology projects have already taken place at Crossrail worksites at Liverpool Street, Tottenham Court Road and Stepney Green. 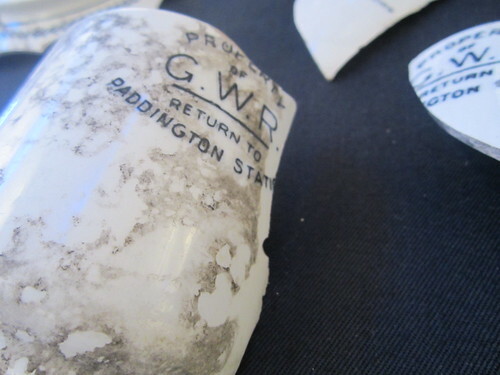 The tableware above is from Paddington station and was found at Old Oak Common train maintenance depot where trains were cleaned and stabled. The exhibition opens to the public today, Saturday 7th July 2012, and runs from 10am to 5pm at The Music Room, Grays Antiques, 26 South Molton Lane, W1K 5LF. Talks will be given on the day by Crossrail contractors from Museum of London Archaeology and Ramboll at 11:00, 12:00, 14:00 and 15:00. More details here. Update - London City Nights also went along to the exhibition on Saturday & have blogged about it too with more photos. I'll update you, if (hopefully) /when the exhibition goes to other parts of London. If you've wanted to chance to moan, praise or question the head of London's transport about what's happening the London Underground, London Overground, bus & London's roads over the Olympic Games today's your chance. 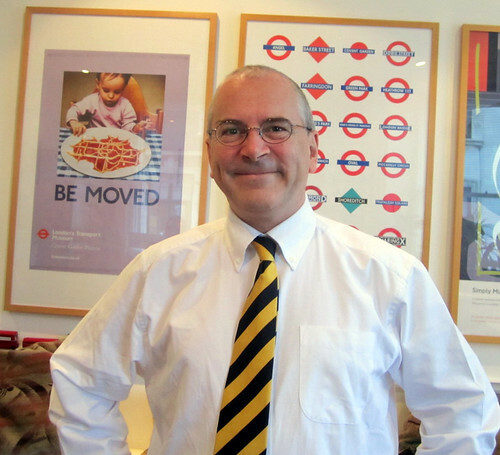 Peter Hendy, London's Transport Commissioner, will be on Twitter between 10:30am and 11:30am on Friday 6 July 2012, to help everyone plan their travel ahead of the London 2012 Games. TfL and the Get Ahead of the Games Twitter feed @GAOTG will be hosting the chat, using the hashtag #AskPeter. During the Twitter chat, Peter will answer questions on all aspects of travel planning ahead of the Games, from how we can avoid transport hotspots, to what businesses can do to prepare for the Games. Peter Hendy, said: 'During the Games, London will be turned into a massive sporting and cultural venue. Parts of the transport network are going to be exceptionally busy, so we're urging people not to chance it. 108 people dressed in panda outfits represented the real-life equivalents who live in the Chengdu Panda Base, a giant panda research centre in Southwest China's Sichuan province. Zhang Zhihe, head of the Chengdu Panda Base, said: "Our ultimate goal is to help the pandas return to their natural habitat and to increase the number of giant pandas living in the wild. 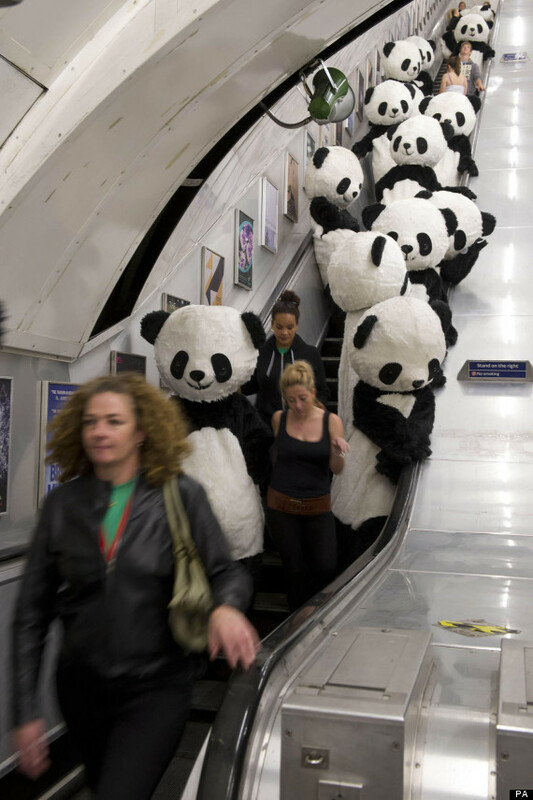 We hope that Panda Awareness Week can help us gain more support for panda conservation and find new advocates for this very special cause." Let's hope these pandas kept clear of Camden Town or Great Portland Street Tube stations as they might found themselves herded into London Zoo.